Finding a qualified garage door company can be difficult. 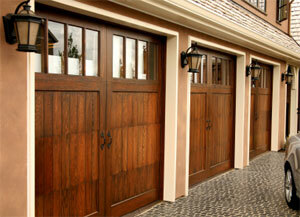 Determining the type of garage door services and repairs you need, can be even tougher. Do you have an older garage door that needs to be completely replaced? Do you want to upgrade your current garage door? Do you need a simple repair? Most homeowners may not even know what the problem is or what they need, therefore, it is vital for them to find out how to go about selecting a quality garage door company they can trust and one that can get the job done right, the first time. Before selecting a company you’ll first want to determine your garage door brand. Some companies specialize in certain product lines (Overhead Door, Wayne-Dalton, Raynor) so it’s often a good idea to determine what you have and then find a company that is certified for servicing that particular line. Most quality garage door companies should be able to handle repairs for most manufacturers but you may want to find out the brand they are most comfortable with. It’s always a good idea to look into and get estimates from at least two or three different garage door companies and weigh the pros and cons of each. Remember that choosing the least expensive contractor won’t necessarily yield the most value. The lowest price does not take into account the level of experience, reliability, skill, honesty, or stability that a quality garage door company will have. Price only measures the cost of the job so make sure to consider at least one other factor besides the amount you’ll have to spend. One of the easiest ways to find a quality garage door company is to ask your neighbors and friends. Many times they can give you recommendations on competent companies as well as ones to avoid. Here are a few of the most important questions to ask a prospective garage door company. It also may be a good idea to print this page for future reference. Does your company carry insurance? General liability, workman’s comp, property damage? Are you certified by the manufacturer to install their products? If so, which one(s)? When is payment required? Do you require a deposit? Will you use subcontractors for any part of the repair or installation? Are you members of the IDA (International Door Association)? Will the owner or foreman be present during the job? How experienced are your technicians/installers? How should my garage door be maintained when you have finished the job? How long can I expect my door to last after the repairs or upgrade? What is your warranty on repairs? Manufacturer’s warranty? Will you be available for follow-ups, maintenance, and support after the job is complete. How long is your quote/estimate good for? Most quality garage door companies, with experience, won’t have any problems answering any of these questions and many will even have the information and documentation ready for you during their visit. If you are in the market for a new garage door or need to have a your garage door repaired and would like to have multiple contractors compete for your business, please fill out the form in the sidebar to your right. If you’re worried about how a garage door affects the value of your home or if it’s worth it, don’t be. In a recent study done by Remodeling Magazine; upgrading a garage door is one of the most cost effective renovations a homeowner can make. In their study, upgrading a basic garage door with an upgraded version returned a surprising 71.9%, making it one of the top renovations in the study.